This guide describes the basic features and gives examples of Turabian and Chicago full note citation styles. (Each style also has an author-date version not covered here.) Chicago and Turabian styles follow the notes-bibliography system, which involves citing sources in footnotes (or endnotes) and then presenting a list of the cited sources in a bibliography at the end of your work. Turabian style is based on and largely mirrors Chicago style, with some minor differences. To avoid repetition, separate explanations and examples have been given in this guide only when there is a difference in treatment. Footnotes are created by inserting a superscript reference number (i.e., smaller and above the line) in your writing directly after the punctuation mark that ends the sentence (or part of the sentence) containing the words or information you are citing. The reference number directs the reader to the corresponding footnote, which should contain the bibliographic details of the source. Numbering and formatting of footnotes is an automatic function in most word-processing programs via the insert footnote command. Notes are normally set one or two points smaller than the general text, and the footnote number is followed by a full stop and a space before the bibliographic details, as in the examples below. Refer to the general rules and punctuation section for more detailed information. 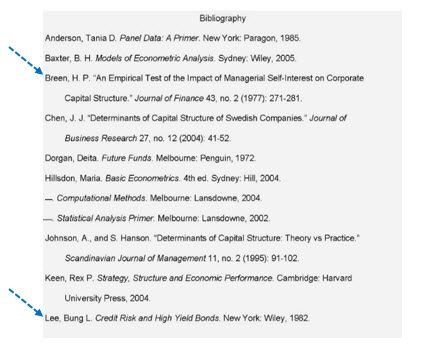 The bibliography is an alphabetical list of all the sources cited. It should begin on a separate page at the end of your paper and provide enough identifying details to allow the source to be located by someone else. Refer to the general rules and punctuation sections following for more detail.